The Constitution of the United States of America is considered by The Church of Jesus Christ of Latter-day Saints to be an inspired document. The Founding Fathers are considered men foreordained, or raised up by God, to establish the constitution and a free nation wherein the Gospel could be restored. The whole philosophy of constitutional government is that all sovereign power rests with the...people. It is capable of specific interpretation and encourages a course of stability and uniformity of action where governmental affairs are concerned. It creates an ideal system of checks and balances where the possible exercise of autocratic powers is concerned. The government has no rights; it has duties only. It is ordained to serve the people. It preserves the natural rights of man. ...we honor more than those who brought forth the Constitution. We honor the Lord who revealed it. God Himself has borne witness to the fact that He is pleased with the final product of the work of these great patriots. In a revelation to the Prophet Joseph Smith on August 6, 1833, the Savior admonished: “I, the Lord, justify you, and your brethren of my church, in befriending that law which is the constitutional law of the land” (Doctrine and Covenants 98:6). 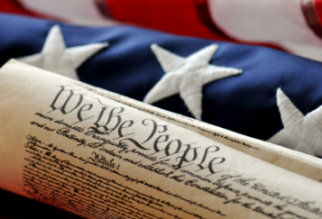 The United States Constitution was the first written constitution in the world. It has served Americans well, enhancing freedom and prosperity during the changed conditions of more than two hundred years. Frequently copied, it has become the United States’ most important export. After two centuries, every nation in the world except six have adopted written constitutions, and the U.S. Constitution was a model for all of them. No wonder modern revelation says that God established the U.S. Constitution and that it “should be maintained for the rights and protection of all flesh, according to just and holy principles” (Doctrine and Covenants 101:77). Reverence for the United States Constitution is so great that sometimes individuals speak as if its every word and phrase had the same standing as scripture. Personally, I have never considered it necessary to defend every line of the Constitution as scriptural. For example, I find nothing scriptural in the compromise on slavery or the minimum age or years of citizenship for congressmen, senators, or the president. As President J. Reuben Clark said, we believe it must grow and develop to meet the changing needs of an advancing world. First from Brigham Young, second president of the Church: “Will the Constitution be destroyed? No: it will be held inviolate by this people; and, as Joseph Smith said, ‘The time will come when the destiny of this nation will hang upon a single thread. At that critical juncture, this people will step forth and save it from the threatened destruction.’ It will be so” (Journal of Discourses, 7:15). Now another witness, John Taylor, third president of the Church: “When the people shall have torn to shreds the Constitution of the United States, the elders of Israel will be found holding it up to the nations of the earth, and proclaiming liberty and equal rights to all men, and extending the hand of fellowship to the oppressed of all nations” (The Gospel Kingdom, Deseret Book Co., 1943, p. 219). This is part of the program. Quotes from Mormon Leaders on the Constitution and Founding of the U.S.
“The Lord himself said that he raised up the very men who framed the Constitution of the United States and directed that membership of this Church should pray for and sustain those who represented the Constitution of this land. ↑ Bruce R. McConkie, Gospel Doctrine, Second Edition, pp. 159-160. ↑ Ezra Taft Benson, “The Miraculous Constitution,” Friend, Sep 1987, inside front cover. ↑ Gordon B. Hinckley, “The Times in Which We Live,” Liahona, Jan 2002, 83–86. ↑ Letter from Washington to Lafayette, 7 Feb. 1788, quoted in Catherine Drinker Bowen, Miracle at Philadelphia, Boston: Little, Brown and Co., 1966, p. xvii. ↑ Quoted in William O. Nelson, The Charter of Liberty, Salt Lake City: Deseret Book Co., 1987, p. 44. This page was last edited on 11 November 2013, at 12:35.